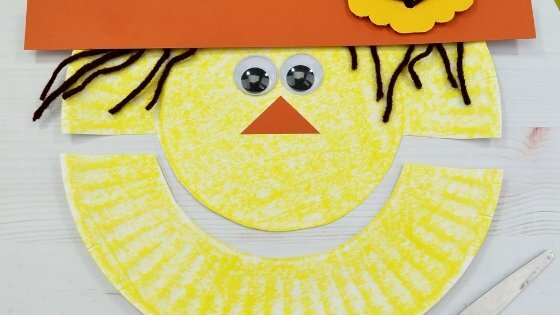 This Scarecrow Paper Plate Lacing Activity is such a great way to teach your little ones how to maneuver their little fingers and learn some fine motor skills. 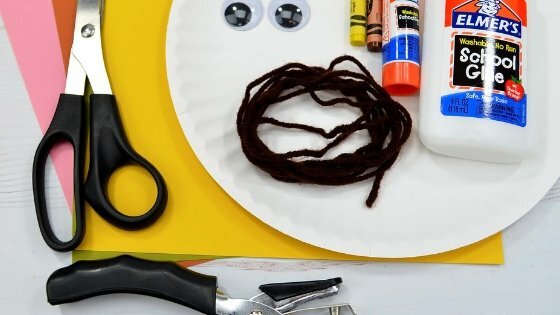 Make learning fun and exciting with easy paper plate crafts and even some exploding science experiments. 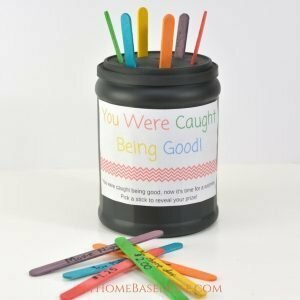 From start to finish this craft could take as little as 10 minutes, but if your kids are like mine they want NO help from Mom so it could take longer. 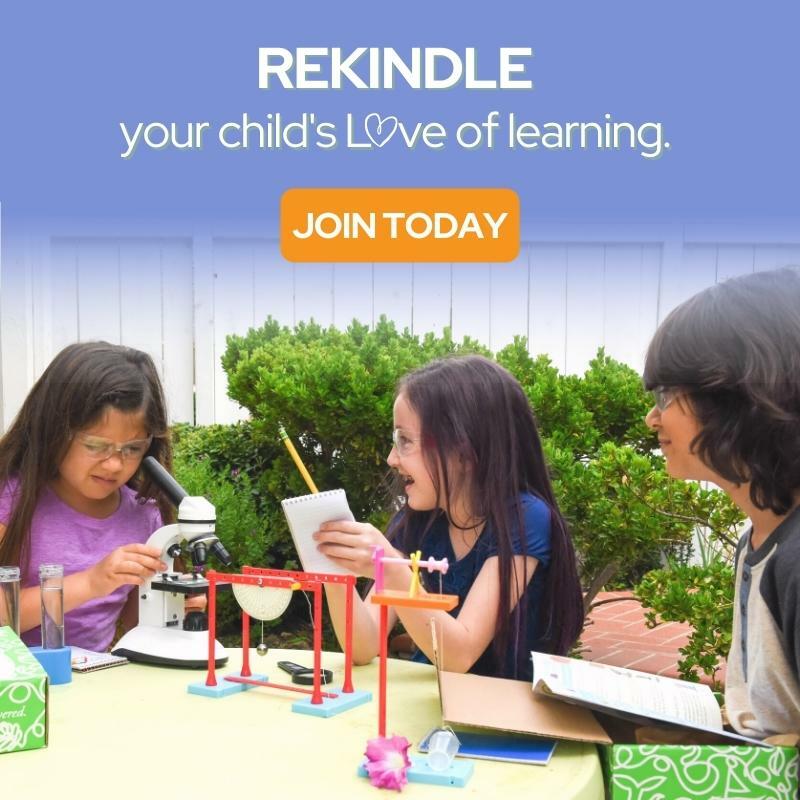 Either way, allow time for their creativity to flow and then be sure to hang your Scarecrow up to show it off! 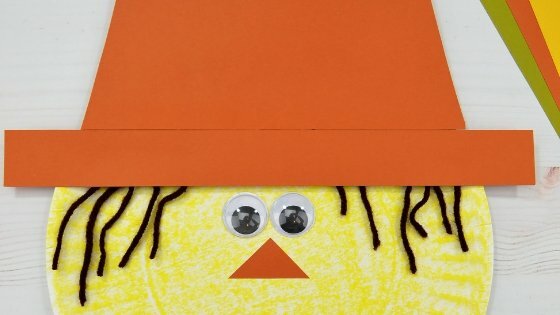 Next, make a hat & a triangle nose with the orange construction paper. 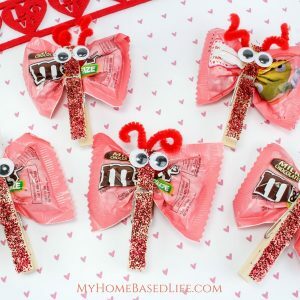 Attach these to the yellow plate with some googly eyes to create a face. 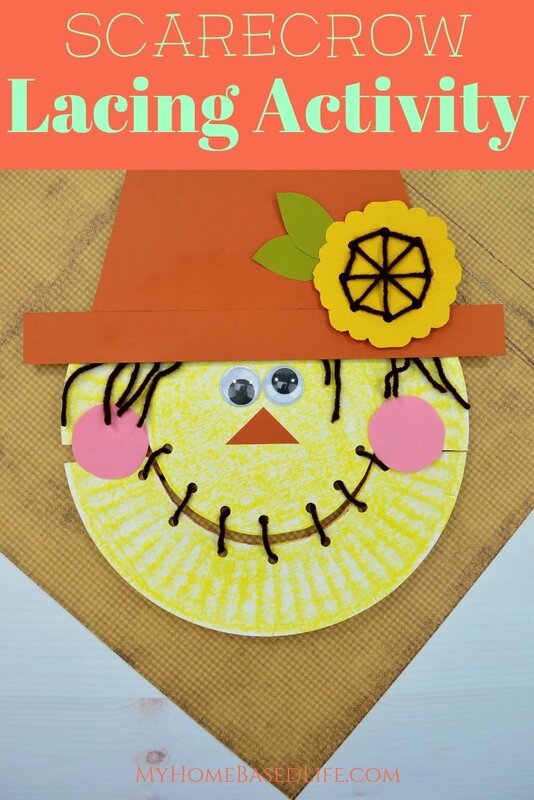 Glue some pieces of yarn under the hat to give the scarecrow some hair. Let’s embellish the hat with a sunflower. Start off by cutting out a square and folding it in half twice. 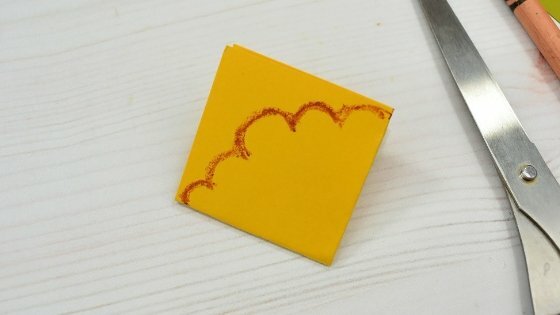 Then draw a similar scallop pattern with the crayon and cut it out. Unfold to reveal the flower. Next, punch holes along the edge of the flower. 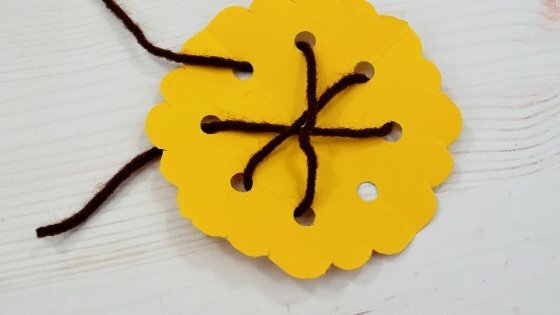 Weave the brown yarn through the holes, creating the ‘seeds’ of the sunflower. Tie the loose ends to the back and glue to the hat. Cut and glue two leaves from the green paper to finish off the flower. Next cut the paper plate as shown: notching in at both sides and creating a half circle/smile in the center. 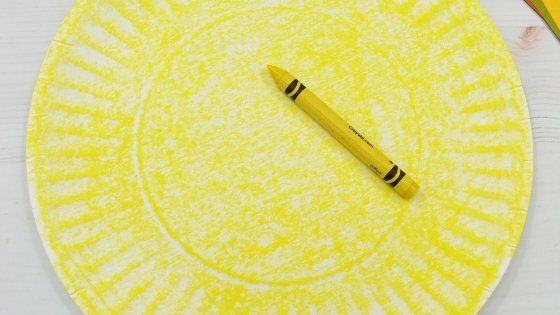 Use the brown crayon to mark symmetrical dots along the top and bottom mouthpieces. 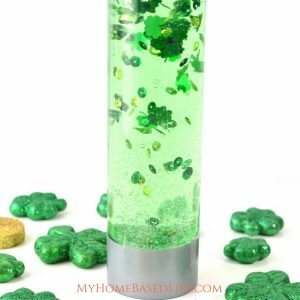 Hole punch at each dot mark. 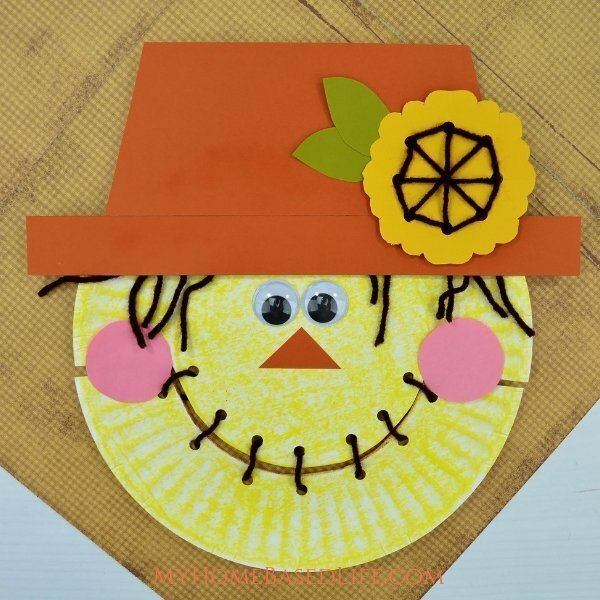 Weave the yarn through the holes to create the scarecrow’s smile. Tie the loose ends with neighboring stitches on the backside. 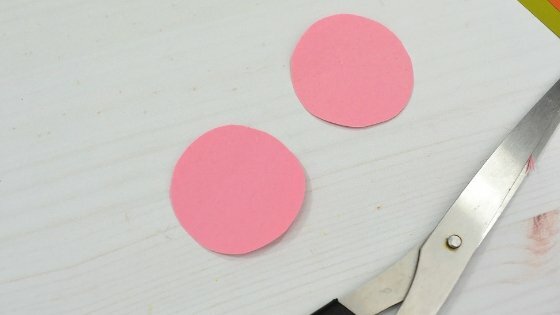 To finish the face, cut two pink circles & glue them to the top part of the plate only to allow the bottom to move freely. 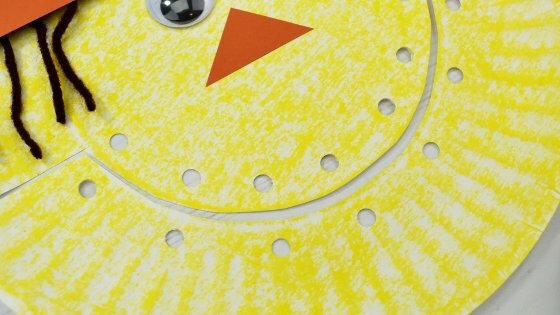 This Scarecrow Paper Plate Lacing Activity is such a great way to teach your little ones how to maneuver their little fingers and learn fine motor skills. Next, make a hat & a triangle nose with the orange construction paper. 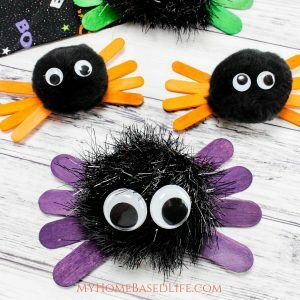 Attach these to the yellow plate with some googly eyes to create a face. 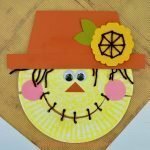 Glue some pieces of yarn under the hat to give the scarecrow some hair. Let's embellish the hat with a sunflower. Start off by cutting out a square and folding it in half twice. 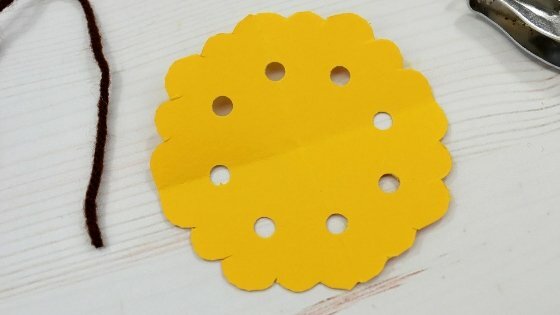 Then draw a similar scallop pattern with the crayon and cut it out. Unfold to reveal the flower. Next, punch holes along the edge of the flower. 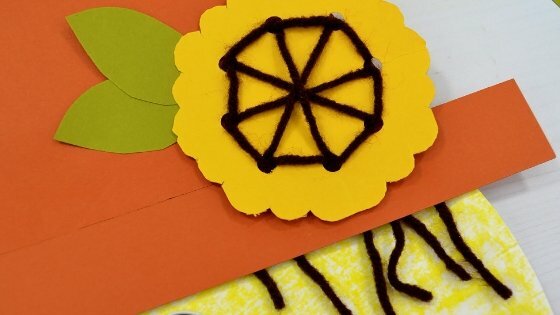 Weave the brown yarn through the holes, creating the 'seeds' of the sunflower. Tie the loose ends to the back and glue to the hat. Cut and glue two leaves from the green paper to finish off the flower. 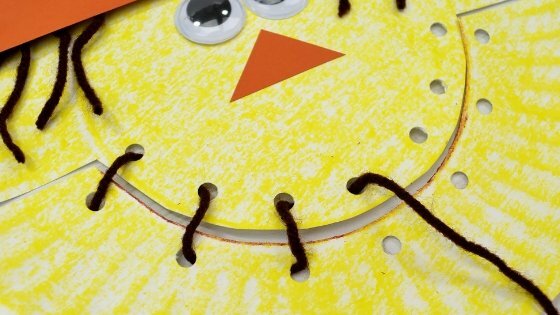 Weave the yarn through the holes to create the scarecrow's smile. Tie the loose ends with neighboring stitches on the backside.